[02:00] Introduction. Meet James Ashley, CEO of Green Drone advertising, a company that specializes in green marketing. [02:16] Projection Mapping. Green Drone uses drones to carry projector that can project data and media onto the 3-dimentional surfaces. Examples of projection mapping can be found at Vivid Sydney. James describes what projection is and how Green Drone might use them. [04:18] Interaction. Since the drones move with the projectors, they can become part of the overall experience, thereby creating new, creative and innovative interactions. [04:44] Production Status. Some of the drones are prototypes, others are in production. The drones are limited to current regulatory requirements. [05:18] Applications. James discusses some of the applications that are possible with projection mapping. The drones are able to create a dramatic, memorable statement, that for some brands, provides the opportunity for that “wow” moment. The drones are able to geo-target with mobile phones, allowing them to connect with individual users and target messages to the finest grain possible. [09:04] Technical Specs. Green Drone has various size drones to carry different size projectors. The company is working on syncing the drones so they be able to fly in unison or a part of an overall planned program. [10:16] The Company. Green Drone is a new company, the product of Jame’s interest in drones and sustainability. Advertising can be a wasteful process, with all of the paper that is used. Green Drone attempts to develop marketing and advertising campaigns. 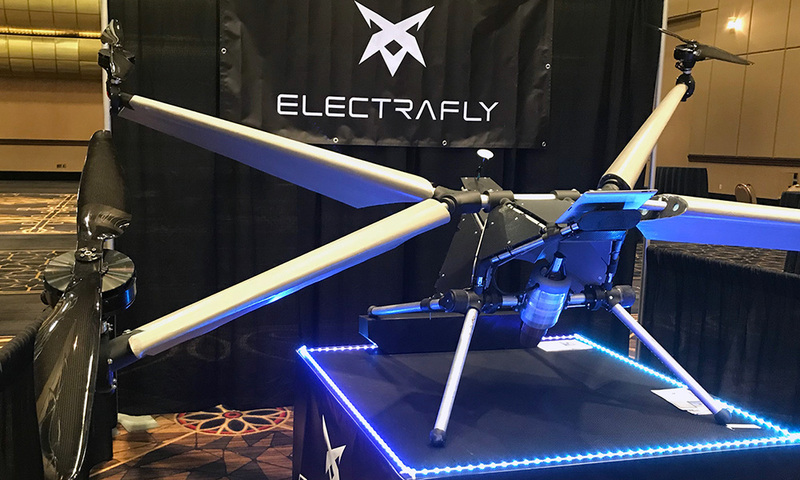 The company uses other forms of sustainable advertising while it works through the regulatory requirements to fly the projection mapping drones. These include smart green posters, stencils and digital advertising. [13:13] Challenges. The biggest challenge for the projection mapping drones is the need to fly at night, when current regulations prohibit night flying. The company is working on an exemption and hopes for resolution by the end of the year. [13:48] Benefits of Projection Mapping. James describes benefits of using projection mapping over print media, namely, programmable, few limitations for deployment and can create a memorable experience to display a brand or message. [15:24] Interaction Experience. James goes into more detail on the how the drones can interact with people, cell phones and display messages directed to individuals or targeted audiences. [17:44] Company Positioning. Companies interested in seeing if projection mapping is right for their brand should connect with Green Drone now, as the level of planning and coordination can be significant. [17:44] The Future. Green Drone hopes to expand internationally and develop a business model that will allow for franchise opportunities to grow. [20:07] Impact on Advertising. James hopes that Green Drone advertising will help move the industry towards a more sustainable and green perspective, by using a variety of new technology, such as biodegradable paper, near field communication technology and RF-ID tags – think Minority Report. Example of projecting mapping of the Green Drone local from a drone. One of Green Drone advertising drones.